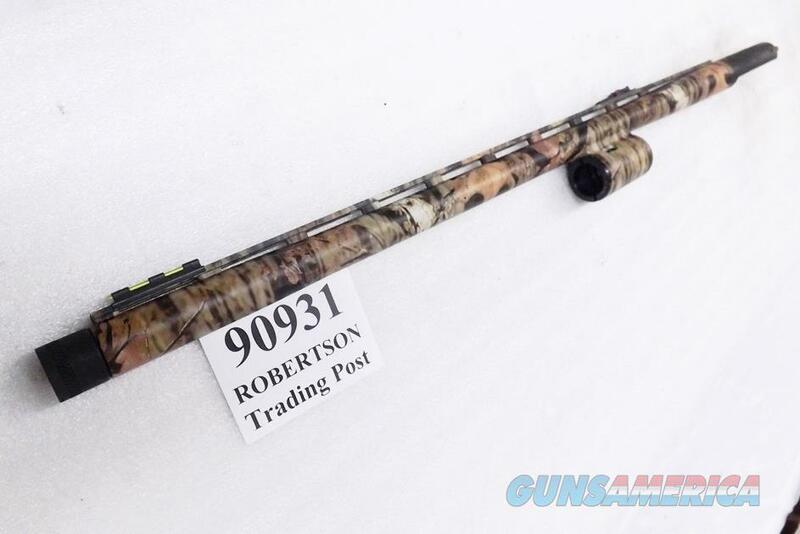 Description: Here is Mossberg’s 24 inch Turkey Barrel for its 935 series of 3 1/2 inch Magnum semi automatic shotguns. Barrel Manufacturer is O.F. Mossberg of Torreon, Mexico, the facility where most of the company’s barrels have been made for the past 25 years. Importer and Warrantor is O.F. Mossberg of Eagle Pass, TX. Construction is entirely steel, except for the sight tubes. Chambering is 12 gauge, 2 3/4 inch, 3 inch, and 3 1/2 inch shells interchangeably, but NO SLUGS. Bore is oversized diameter and will not safely project any rifled slug. Choke system is Mossberg Accu-Mag, and this barrel comes furnished with a NO STEEL .695 diameter Ulti-Full tube. Sight system is a 10 post Ventilated Rib, .375 width and 1/4 inch above the barrel at mid point. On top of the rib, it has a steel encased green fiber optic front sight, with a matching two tube red fiber optic rear sight that is windage and elevation adjustable. Lug assembly is correct for any 935 Mossberg, with spring and gas rings. Finish is Mossy Oak Break Up Infinity with black matte sight bases, tube, and chamber hood. This barrel is brand new and unfired, but not packaged because we pulled it out of a brand new 935 Combo Gun. Replacement pricing on its nearest production counterpart, the 90931 with Mossy Oak New Breakup finish, is $254 on mossberg com. We’re offering the Infinity Camo barrel in the photos, however, or one of its identical mates, each	for only	$ 149.00. >>>>>>>>>>>> Grips, Magazines, Slings, Holsters, Scopes, Mounts, Parts , buy any 3 items and get Free Shipping! Guns and ammo excluded. Lower 48 only. Live checkout orders that qualify will have the shipping fee removed before the order is charged. Single items non gun non ammo, flat $10. $20 Flat Fee any shipment to Alaska, Hawaii, or Puerto Rico. Magazines, small light non-gun items ride free with ammo or gun orders. Checks OK, 7 day hold. GA Pay, MC, Visa, Discover phone- or fax-in 7 3 1 9 8 9 4 7 2 3 orders, USPS Money Order items shipped ASAP please put your full information, item number, and what the item is on any messages. Phone hours 8:00 – 5:00 CST Mon – Fri. Robertson Trading Post 117 Front Street PO Box 365 Henderson, Tennessee 38340. We buy, sell, and trade. Always have, since 1952.